March was a busy month for the OD Shag Club and April will be no exception. Our beginner shag lessons started and we have approximately 25 people learning to shag. They are doing a great job. I saw several of them on the dance floor at the Chili Cook-off and they were looking good. Thank you Sonny and Tina Tomberlin for volunteering your time to teach the dance we all love to our members. 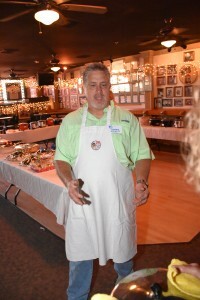 The Chili Cook-off in March was fantastic! We have three celebrity judges: Harold Worley, Milford Powell and Elaine Harrington. They did a fantastic job. I know that I would not want to taste all the different pots of chili that were in the contest. The winners were: lst place – Connie Livingston, 2nd place – Paula Webb and 3rd place – Faye Chowning. Way to go! Thanks to Donnie and Wendy Schultz for making this such as great event! April will be a busy month! We have our business meeting on Tuesday, April 5th. On April 12th, Steve and Kitty Earles will be teaching in our monthly Share a Shag Step, SASS, at Fat Harold’s at 6:00 p.m. I can’t wait to learn something new! Spring SOS will start on Friday, April 15th and we will be busy. We will have a tent in the parking lot of Fat Harold’s and will be selling merchandise the first weekend of SOS and Thursday and Friday of the next week. Cathy and Connie will be looking for volunteers to help. We will be selling golf cart fundraiser tickets every day during SOS, so Billy will need a lot of volunteers. This is our big fundraiser and the money is used to fund our events such as the Oyster Roast, parades, cookouts, and some of our charity giving. Please volunteer to help with the fundraiser. Another highlight this year is our very own, Paul Harrison, will be receiving his ICON award at the ACSC meeting on Saturday, April 23rd at 10:00 a.m. at the OD Resort Beach Cub. Any member of the OD Shag Club that would like to come and celebrate this wonderful honor with Paul is more than welcome! Once we finish watching Paul received his ICON award, we will jump on our golf carts and start lining up for the SOS parade. Wendy Schultz has done another outstanding job and getting this organized again. If you have not signed up for the parade, contact Wendy. It is a barrel of fun! And if that was not enough fun, we will finish out the month cleaning up our little strip of paradise with our Spring Clean Sweep. Bill Bacon and Tim Webb will be looking for volunteers to help with our Clean Sweep. It is a good time socializing with other members and doing something good for the community. So rest up for a few days and let’s start April out with a bang! What a fun time we had at the chili cook off party at Fat Harold’s last night. There were 138 members in attendance. It was a small gathering but a great one! Thanks to all of you who brought chili and desserts, I thought it was all good. The Food Committee did a wonderful job once again and the Hospitality Committee did a great job also. Congratulations to the three of you for making such great chili! I am sure they probably had some heart burn after trying all that chili. Thanks to the Entertainment Committee. Kathy McCoy sponsored a dance contest where you collected beads whenever you asked someone to dance. The dance floor was full most of the night. The two people who collected the most beads and each won a $20 gift certificate to Fat Harold’s were Susan Harrell and Brian Mitchell. Other winners included our 50/50 winner, Diane Bauer who walked away to go shopping with $201. Our Name tag winner was Tim Shumway and he collected $20 and our Logo winner was Sandra Sessoms who also collected $20.00. On Saturday, March 12, 2016, the club was well represented in the NMB St. Patrick’s Day Parade by 110 of its members. Twenty-six golf carts were beautifully decorated and carried 106 members donned out in their St. Patrick Day apparel. Thanks to Cathy and Bob Sanders for carrying our banner. I am happy to report that the OD Shag Club won Second Place in the Non-Profit division of the parade!! Way to go Wendy and Donnie Schultz for organizing our troop for the parade. Special thanks also to Susan Harrell for helping to sign in participants, Tina Tomberlin and Monica Powell for helping to pass out beads, and Pat Harris for taking photographs. I am always so proud to see how creative our members are with their golf cart decorations and costumes! You didn’t let me down this year!! A fun time was had by all! Billy Powell also had a booth set up at the festival for the golf cart fundraiser that turned out to be a big success. Two hundred forty-three tickets were sold. Thanks go out to Rich Young, Sonny Tomberlin, Brian Schmitt, Debbie Schmitt, Lou Garrenton, Bill Anderson, Elaine Powers, Jerry Harrell, Bill Sawyer, and Jon Haris for helping to man the booth and be such great sales people. Thank you Billy! Another great day for the OD Shag Club! It is the beginning of March and I, for one, am happy to hope that warmer weather in on the way! If you missed the Oyster Roast, you missed a great time. I want to thank Donnie Schultz and his partner in crime, Wendy Schultz for all their hard work. Listed below are the people who helped Donnie with the Oyster Roast! These folks set up the tent, cooked all day, set up the tables, garbage cans in the Arcade, broke down the tents, tables, took the oyster shells back to the recycle center…..in other words, they worked all day and half the night to make sure the rest of us had a good time. Be sure and thank them. Donnie Schultz and Ronnie Rogers made the Chicken Bog and it was the best EVER! The OD Arcade was hopping. Cathy Jamiolkowski and her team of volunteers were surrounded by members purchasing new merchandise while Billy Powell and Rich Young were busy selling 50/50 tickets. We have a busy month ahead of us. Our first beginning Shag Lesson starts on Thursday, March, 3rd. These lessons are free to members of the OD Shag Club and you do not need a partner. Our SASS (share a shag step) is on Tuesday, March 8th and of course, the St. Patrick’s Parade is on Saturday, March 12th. Rumor has it that the March party will be a Chili Cook-off with cash prizes. Stay tuned for more details from Donnie and Wendy Schultz. A note will be going out soon with all the details. This should be a fun time at Fat Harold’s, eating chili and dancing to our favorite songs. The OD Shag Club will met on Monday, March 21st at Myrtle Manor to entertain the residents. If you have not attended in the past, you have missed a rewarding night. Joe Ferlauto has done an outstanding of coordinating an appearance by Elvis and some of the Junior Shaggers. Please join us at this event. You will have a great time. On Saturday, February 20, 2016, the club held its world famous Oyster Roast. There were 272 members and guests who had knife or spoon in hand. Chicken bog was provided for those who didn’t want oysters. Cathy and Connie sold a lot of new merchandise as well as the new oyster roast shirt, bringing in over $1300 in sales. Billy Powell and Rich Young sold $965 in 50/50 tickets. John Turner and Paul Luger won $483 from the 50/50. Bill Anderson, the DJ entertained the crowd. All had a great time, thanks to the committee which did such a great job. The committee included Donnie Schultz and his team plus those who volunteered to help. Thank you, thank you, and thank you to the members of the OD Shag Club who came out and participated in this special evening. The participation by both the members of the club and the residents of the Manor was exceptional; smiles were in abundance all around. A special thank you to Debbie Schmitt for the Bunny Cakes, and Linda Campbell, a great Master of Ceremony. The Junior Shaggers started off the evening with some impressive dances. They were than followed by Earl and Beverly Robinson, 2010 National Shag Champions in the Masters Division. Our own shag team did some good-looking steps to some great songs. Linda, Lou and Lenny did their three-person dance and the residents were very impressed, than of course Lenny told some jokes to the amusement of the crowd. Sheila and Bill Seymour, 2016 National Shag Competitors in the Pro Division, did some fancy stepping, followed by Annette Johnson and Dwight Langley who did a fantastic smooth shag or as they say in the shag world “A Smoothie”. Elvis (Ken Thompson), a professional Elvis impersonator, truly entertained the audience to his authenticity as Elvis. His attire was top notch, his mannerism was perfect, and in a nutshell he was fantastic! Our own Easter Bunny (Donnie Schultz) came hopping into the room to “Peter Cottontail”. He personally greeted each and every resident as the members of the club distributed chocolate Easter Bunny’s. Last but not least, Mr. Smooth, Paul Craver entertained the residents with two beautiful songs. He personally greeted many of the lady residents and the smiles were abundant. A sing-a-long was warranted and as we sang to “That’s Amore” the members of the club came out and danced and sang with the residents, it was something to behold. We then all sang “God Bless America” and wished the residents a happy and healthy summer. Until December, this is Joe Ferlauto your Myrtle Beach Manor Chair saying thank you and may each and every one of you have a healthy and happy summer.